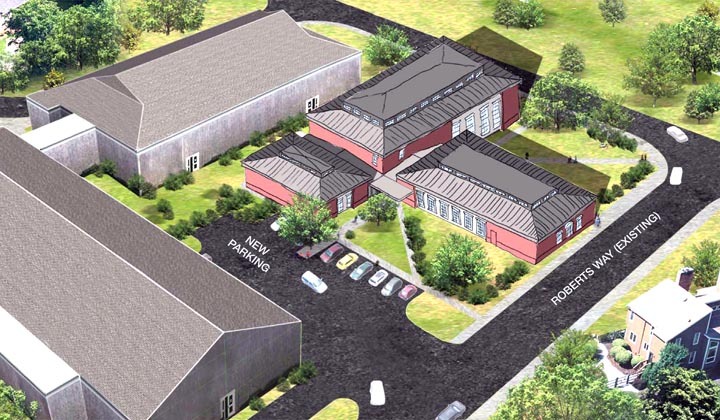 The library may move to a new building on the site of the old Edgartown school, as seen in this artist's rendering. In 1904, Edgartown received a gift from philanthropist Andrew Carnegie: $4,000 for a town library, one of more than 1,600 libraries the steel magnate bankrolled nationwide. The brick building on North Water street — the property was deeded to the town by resident Caroline F. Warren — was the smallest Carnegie library built in Massachusetts, and as part of the agreement with Mr. Carnegie, Edgartown agreed to spend one-tenth of the gift price on library operations. In 1904, Edgartown’s library spending jumped from $129 to $400 a year. More than a century later, after three additions and years of debate about how and where to expand their town’s library, Edgartown residents will be asked to take a big step forward on a brand new library at April’s annual town meeting. The new library would cost about $11 million (with half the funding coming from the state), and advocates say it would meet the 21st century needs of Edgartown: yes, more space for books, historic materials and art, but also easier parking and access, public meeting space, and room where residents can read, use computers and socialize. The town-meeting warrant will ask voters to approve a Proposition 2 1/2 override to spend $4.9 million for the new library on the site of the old Edgartown School, pending a $5 million grant from the Massachusetts Board of Library Commissioners’ library construction program. Another $1.1 million for the library has already been paid by the town through allowable credits. Last summer, Edgartown was one of 28 libraries in the state to apply for library construction grants, and ended up fourth on the waiting list, with eight libraries getting first-round funding. Celeste Bruno, a spokesperson for the state board of library commissioners, said the library has since moved up to third place on the waiting list, and a number of factors, including the state budget and whether libraries ahead on the list secure their part of the funding, will impact when Edgartown receives its grant. The grant process was highly competitive, Ms. Bruno said, and library trends have turned toward building sustainable buildings. Edgartown’s library will be Leadership in Energy and Environmental Design (LEED)-certified, which will qualify the project for more funding. Library trustees have said they expect to receive the funding roughly sometime in the summer of 2013, at the end of fiscal year 2013 or the beginning of fiscal year 2014. With construction on the library expected to take two and a half years, the library would likely open by 2016 if all goes as planned. Last year, town meeting voters unanimously approved the library design and grant application, which culminated years of discussion about what to do about the town’s library situation. The current, 6,842 square-foot building consists of the original Carnegie building plus two additions from the 1930s and 1970s. In 2006, the children’s room was closed for 10 months because of mold and structural issues, and in 2008, the library was closed for six months because of a furnace back-up. The location has also been cited as a problem: During the summer, North Water street is backed up with traffic, and the site offers limited parking. With these needs in mind and an eye toward expanding the North Water street building, the town purchased a neighboring building, the rundown 1790’s Capt. Warren House, for $3.5 million in 2005. But expanding the facility posed logistical problems: Even with the additional building, the site was too small and did not offer enough parking. “It was very clear it wouldn’t work,” said library trustee and building committee chairman Carl Watt. So the plan evolved, calling for the library to move up Main street to the other edge of town center, at the site of the old Edgartown School on the Edgartown-West Tisbury Road. The school would be demolished to make sure for a brand new, 15,400 square-foot library. The new library would consist of three parts: a two-story adult library section, a one-story children’s section, and a program room. Each section would have a separate entrance. At a forum last week, reference librarian Nis Kildegaard presented an overview of the new library from a librarian’s perspective, touting the benefits to patrons and the town. While there would be more space for books, he said, with adult book shelving growing from 1,490 square feet to 2,400 square feet, the new library will offer amenities the current space does not: circulation, reference and director’s offices, tutoring and meeting spaces, more space to feature new acquisitions, a proper network room for servers and wires, and three times as much seating, creating more room for “quiet reading, space to be social and space to be quiet,” he said. The library would have a 1,800 square-foot meeting room that could be used as a town resource and will have its own entrance and seating for 80 people, rest rooms, storage space and a kitchen. To serve a need Mr. Carnegie would never have anticipated, the new library would go from 14 to 40 computers. The library will also offer the town an opportunity to showcase history: Mr. Kildegaard said the new facility will have the wall space to showcase the impressive art collection given to the town in 1934 by Charles S. Simpson, a biscuit magnate who grew up around the corner from the library. The new library will also have appropriate space to feature the library’s reference materials, which “might be the best history on Martha’s Vineyard but are not properly preserved, displayed, and accessible to researchers and scholars,” Mr. Kildegaard said. While some might lament moving the library out of the heart of the town, it is “being relocated from one edge of the traditional village to the other,” Mr. Watt said. Back when the library was built, he added, most residents lived in the main downtown area. Now, he said, fewer than one home out of 10 in the main town area is occupied in the winter. At the new location, the library will join the new Edgartown school and the Boys and Girls Club to create a municipal campus, Mr. Watt said, with the location accessible to every bus line that comes through Edgartown and on or close to every major bike path. A parking lot will have 50 spaces, he said, with additional parking available at the school lot during the summer. Mr. Watt said he sees the new library as a community center, with “ample space for any kind of town activities” and a bright, well-lit children’s area. He said there’s community support for the project, despite some criticism. At a community meeting Wednesday at the Chappquiddick Community Center, he said, one couple lamented not being able to get off the ferry and walk to the library. But ultimately, he said, the couple supported the project. The new library would boost annual library costs, but Mr. Kildegaard said at the forum that Edgartown’s costs have been historically low in that regard. Other Island towns spend an average of 2.96 per cent of their annual budgets on library operating costs, he said, while Edgartown currently spends 1.66 per cent. New library operating costs would increase to $780,000, or 2.56 per cent of the Edgartown annual budget. With the library moving, voters will also be asked to transfer control of the Warren House from the Library Board of Trustees to the Board of Selectmen for the purpose of selling the property, with that money going toward the library as well. The last remaining piece in the puzzle, if voters go for the new plan, is deciding what to do with Mr. Carnegie’s gift, the 1904 brick library. In December, the Martha’s Vineyard Preservation Trust announced that they would be interested in taking the lead on what to do with the building, calling for “adaptive reuse” and potentially turning the library into a community or other cultural center. Chris Scott, executive director of the preservation trust, said at the time that the building meets the trust’s criteria for acquisition: It is a historically significant building that served a public use, as well as an “architecturally handsome” building right in downtown Edgartown and one of the rare brick buildings on the Island. Edgartown has received a state grant for sustainable design at the new town library.